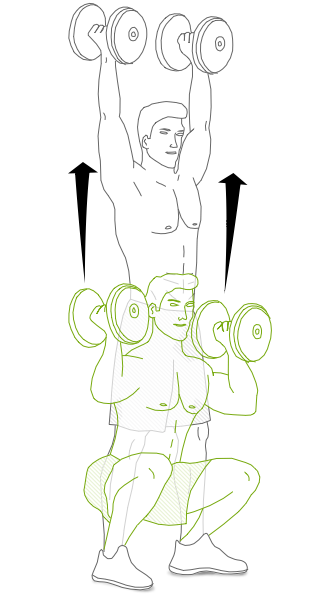 The Best Compound Exercises for Men | Valet. Here's the discouraging thing about fitness. You can be doing two out of three things right and still not see the outcome you're hoping to achieve. Over the last year or so, I'd overhauled my diet to cut out a lot of unnecessary crap and empty carbs. I was also fully committed to working out three to four times a week. I made sure to do the usual vanity muscle reps in the dumbbell area, but mostly I was focused on cardio. And while I had dropped some weight and noticed more muscle, I wasn't seeing the change in my body I was hoping to achieve. I still had that pesky weight around my waist—that dreaded doughy section of flesh that never seemed to tighten up. Until I started doing more compound exercises, that is. Don't get me wrong, we all need cardio and I still love a good SoulCycle session or outdoor bike ride to relieve stress and keep my heart healthy. But in terms of burning calories and fat, I noticed a huge difference after I eased up on the treadmill and stationary bike and started doing more full-body exercises in other areas of the gym. I'm happy to report that the dough is melting from my midsection, I'm down a pant size and a notch (or two) on my belts. There's noticeable tone and definition in my chest, arms and legs too. That's because compound moves like squats, push-ups and pull-ups work your body as a unit—engaging several large and small muscle groups simultaneously— and burn more calories in the process. I now start my workouts with a set of 20 push-ups. Then I hit the pull-up bar (I've got a goal to do 15 clean ones by summer). Then I usually do three sets of three different compound moves. It's good to keep your body guessing, but these are the three I find myself doing the most after consulting with a trusted trainer. What's more, this whole workout takes less time than what I'd typically put in on the treadmill. This is my go-to move. You want enough weight to be challenging after a few reps, but not so much that your form suffers. I've performed it with dumbbells, kettlebells and even those stretchy bands when my hotel didn't have a gym. Stand with your feet shoulder-width apart and your weights racked above your shoulders. Lower yourself down, keeping your back flat and your knees over your toes. Push through your heels to return to standing, while pressing the weights up until your arms are fully extended. Again, this could be done with a dumbbell, kettlebell or simply no weight at all to begin with. But I find holding a dumbbell actually helps stabilize my body during the movement. Stand upright with a tight core and flat back. Extend arms to chest level in front of you while holding the weight. Step forward with one leg. Your front thigh should be parallel with the floor. Drop the back knee. This is one of those kooky looking moves that proves you know what you're doing at the gym. If you don't have a Bosu Ball, you could perform these with a set of dumbbells, but the ball's instability helps strengthen and tone your core. Stand beside the Bosu Ball, flat side up. Place your hands on the sides and apply your body weight. Kick your legs out behind you so that you end up in a starting push-up position. Maintain your balance by engaging your core, and once again transfer your weight through your arms and hop your feet back to the side of the ball. 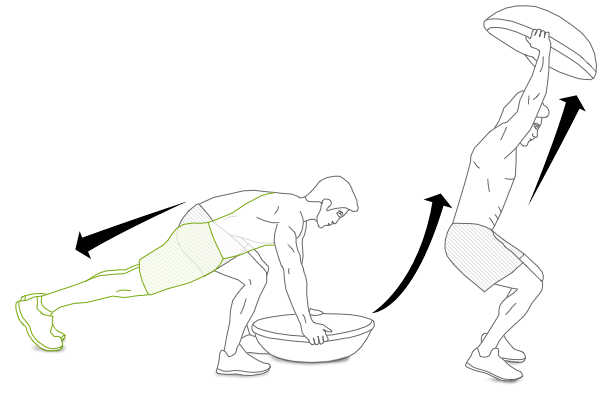 Grip the sides of the Bosu Ball and drive upwards through your glutes, raising the ball above your head. Lower the ball back to the starting position to begin another rep.
Bosu is the trusted brand name when it comes to balance ball trainers. But if you're looking for something a bit more affordable (though possibly a little less durable), there are solid options like LFK's yoga trainer ball. Not seeing the results you want? We can fix that.